Two explosions killed at least two people and injured more than two dozen near the finish of today's Boston Marathon. 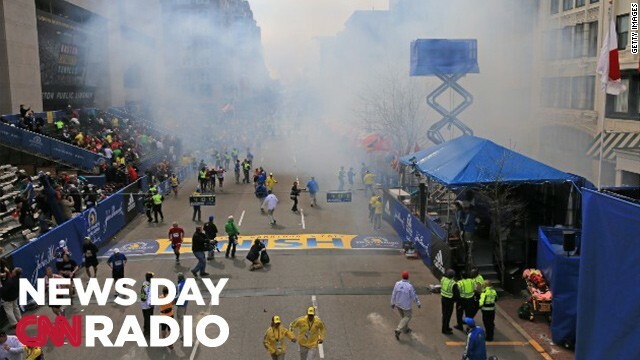 Two explosions struck near the finish line of today's famed Boston Marathon. Early reports from Boston police indicated at least two people were killed with 28 injured. Police evacuated a nearby hotel, and subway service in the area was suspended in the immediate aftermath. CNN producer Matt Frucci was covering the race, and said the two blasts happened around 2:45 p.m. ET . "The first one I saw closer to the finish line from where we were. It was big, it was booming, I saw a big mountain of smoke come up. About 10 seconds later across the street from me on the sidewalk another big explosion. People are hurt." The U.S. Supreme Court took up a case today asking a simple question: can a human gene be patented? The answer to that could put billions of dollars and decades of research on the line for pharmaceutical companies across the U.S. One biotech company, Myriad Genetics, was able to isolate two genes that increase a woman's risk of breast cancer. It wants to keep its patents and full control over testing and research of those genes. Chris Hansen is an attorney for the groups challenging Myriad's right to own the patents:. "The Supreme Court has held for 150 years that you can't patent a product of nature. You can't patent gold or iron. A human gene is nothing more than the same thing. A human gene is in fact, a piece of the human body. Its structure and function are dictated by nature." Please take that ( Breaking News ) post off the tv screen,theres so much that one misses with that on the screen.